Christmas is a time for friends and family to come together to celebrate. Whether you are hosting a small group or a large gang in your home, it always pays to be prepared. Julie Paul, Head of Interior Design at OKA, shows us a few tricks of the trade on how to refresh your home for the festive season with just a few simple Christmas design tips. This is the first impression your guests will get when entering your home so it’s important to make it welcoming. Mirrors are brilliant in a hallway – if it’s a dark space then it will reflect light and if it’s a small space, the mirror will create the illusion that it’s much bigger. A runner or rug is a great way to bring in some warmth to greet your guests with. A welcoming lamp on a table or console is also lovely touch. You could update existing lamps with a new shade – something patterned in a contrasting colour will really make a great first impression. Christmas decorations can start here too. Wrap a pine and cone garland around the banister of your staircase then add in dried orange pieces and cinnamon sticks to evoke a wonderful Christmas scent. A burning scented candle wafting through the hallway is also a very festive welcome – choose a seasonal fragrance such as Winter Forest or Alpine Forest from our Scent for Living range. Make your guests feel at home by adding a few personal touches to their bedroom. Some new throws on the bed are an easy and affordable way to update the room. Depending on the style of your room, you could go for a something patterned like the Ankinara Throw or keep it more neutral with the Cria throws. Coordinate with cushions and fresh new bed linen to make the bed look even more inviting. Add a posy of faux flowers in a vase beside the bed or on the dressing table for another hassle-free finishing touch. If you have a guest bathroom, it’s always a nice idea to offer some luxurious bath oils and a scented candle for them to enjoy while relaxing. Create a home from home from home by going that extra mile: storage accessories such as faux shagreen trays or boxes for guests to put their jewellery and cuff-links in are a thoughtful touch, as are little jars containing beauty essentials they may have forgotten. 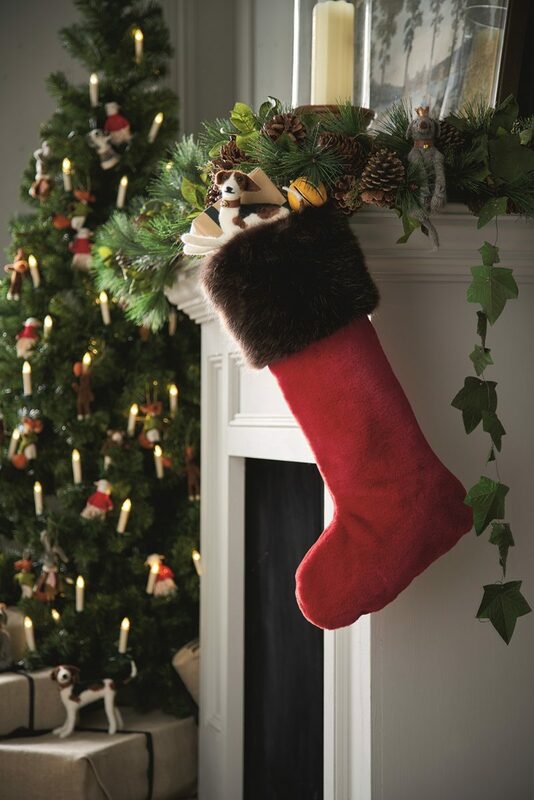 If there is a fireplace in the room, it’s fun to hang a stocking or two from it – and pop a present in too if you’re feeling generous! This will be the heart of all the Christmas celebrations. Extra seating is always a good idea – it’s a bit more of an investment but we often recommend to clients that they go for side or coffee tables which can double up as seating if needed. New cushion covers are undoubtedly the quickest update. At this time of year, you can indulge in heavier fabrics such as velvet in deeper jewel tones, depending on your existing design. If you’re lucky enough to have a fireplace, make it the focal point: replace your old log basket with a new one, add a fireguard, then decorate the mantel with fun stockings and pine garlands with our remote-controlled LED tree light candles clipped in to add a warm, old-fashioned glow. I always suggest LED candle lights to clients; they are a great choice as they look so realistic and you don’t have to worry about them burning down in to the early hours and becoming a fire hazard! Christmas wouldn’t be the same without a well-stocked drinks trolley. Update yours with a new set of glassware such as our Pulcinella Cocktail Glasses, shake up a storm with a glamorous cocktail shaker and introduce fun details such as our Gecko Bottle Opener. 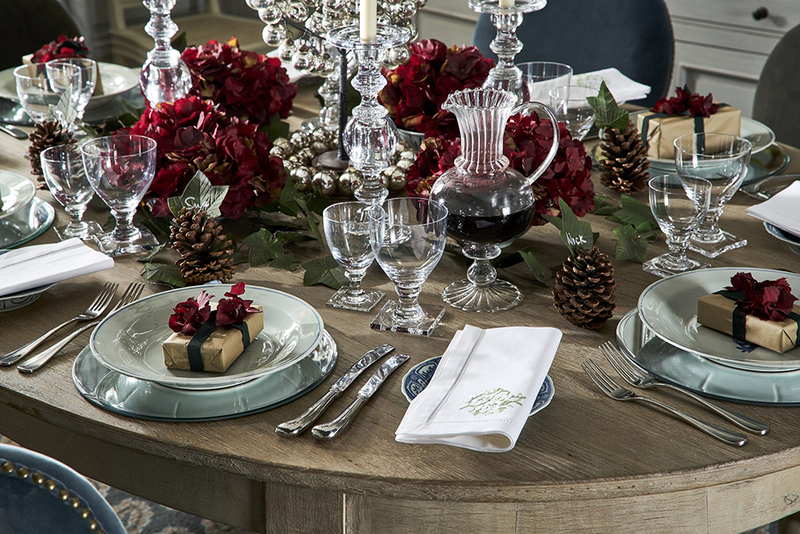 Wow your guests on Christmas Day with a fabulously decorated table. A clever way to refresh your table setting for the festive season is by using new glassware such as coloured water glasses or beautiful heavyweight crystal goblets, or investing in some brightly coloured or patterned side plates to update your existing tableware. You can add real variety to the table with different styles of candlesticks – whether low or high, glass or wooden, they are an excellent and easy way to add glamour and style. Napkins with embroidered details add a nice touch and we love using hurricane lamps surrounded by faux wreaths to create a festive centrepiece. Faux wreaths are a fantastic investment as they can be updated year after year, simply by adding different decorations. For something a bit different, our new Tinio Trees with antique silver baubles will add a modern twist to your Christmas tabletop. Drop by our King’s Road showroom to see how OKA dressed it for the Christmas period. To browse OKA’s full winter collection, click here.